Do goldfishes celebrate Saint Valentine? I am sure they do celebrate Saint Valentine, probably the don’t care much about it as everything else, but they do it. Life as a goldfish must be good, they don’t ask themselves too many questions, they just swim and swim and keep going ahead, no matter what – and if they are lucky enough, they get to live in one of the most beautiful reef in the world (do they actually live in coral reef?!) and enjoy their carefree life with no stress at all. Kind of. Life in California sounds a bit like a goldfish’s life. Always sunny, everybody’s happy, very neat lawn with beautiful flowers, big houses, state-of-the-art cars. Everything looks just perfect. And all these people who just keep swimming. I am sure everybody celebrates Saint Valentine’s Day down there. 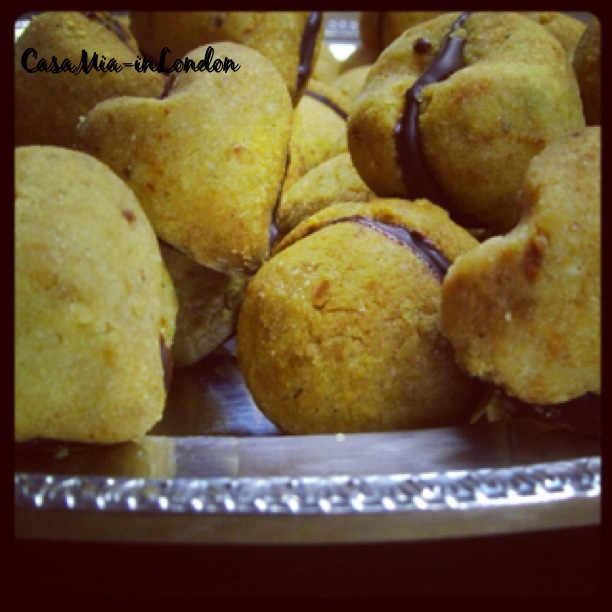 Anyhow, here another themed recipe for this glorious Saint Valentine’s Day: Heart Shaped ‘Baci di Dama’. The literal translation is ‘Kiss of a Lady’, quite romantic (!) and very nice. 1. I have used half ground almonds and half ground hazelnuts, this gives you brownish biscuits – if you prefer all white biscuits use only ground almonds and avoid the orange zest. 2. if you don’t have potato flour, just replace it with regular flour. 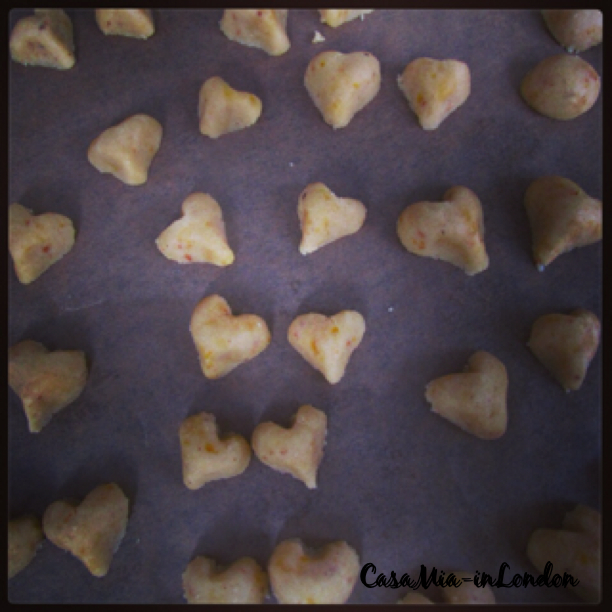 3. if you want this gluten-free, it works just as fine with rice flour, 140 gr all together. Blend together the almonds and the sugar, plus the hazelnuts if you are using them. Sieve the flour and the potato flour together and add these to the almonds mixture. Grate the peel of one orange and add it to the mixture. Cut the softened butter in small pieces, break the egg yolk and add the two to the flour mixture. Mix everything thoroughly to form a ball. Everything comes together nicely with just a bit of kneading. Cling film it and rest it in the fridge for at least 1 hour. The longer, the better. Take the dough out of the fridge and divide it into 3 pieces and start working with one of them, keeping the others refrigerated. It’s better to keep the dough cold as much as possible while working with it. Cut it in small pieces, more or less as big as 10 pence. 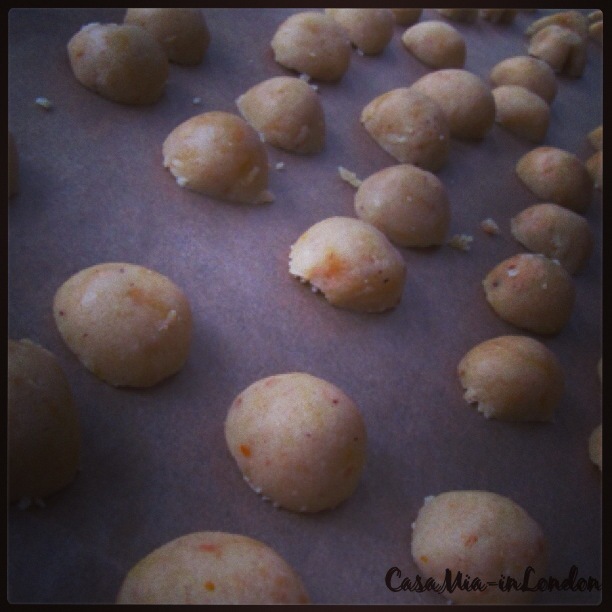 Then roll each little piece of dough in a nice little ball. Even if they look too soft to you, no worries, they will then firm up into crispy mini-domes, ready to fill, once baked. 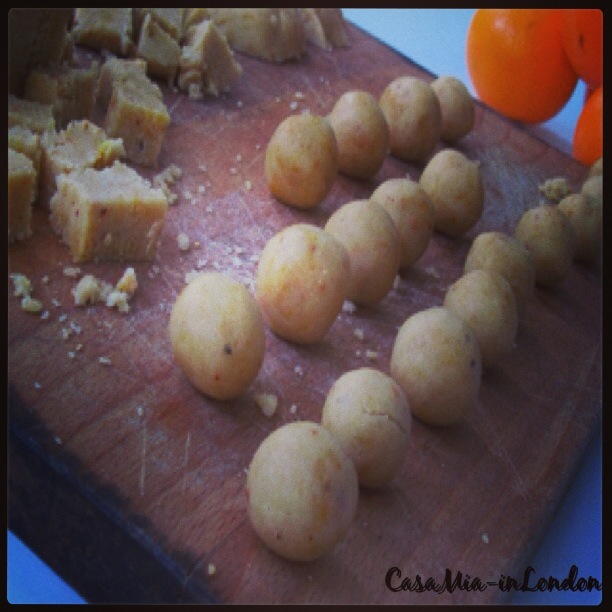 Cut the little balls in half with a sharp knife and place them on the baking sheet, slightly spaced apart. I put the two halves next to each other, so it’s easier to pair them later on. To make the heart shape, I use a toothpick to make the upper part a little bit going inside, and I shape the bottom part of the little half ball with my fingers. Bake the Baci di Dama for 15 minutes, rotating the baking tray in the oven midway during cooking, until the tops are lightly golden brown. Once ready, let the biscuits cool completely. While baking, melt the chocolate in a dry bowl set over a pan of barely simmering water. Put some paper into the water to avoid direct heat onto the bowl. Let the chocolate cool down a little bit, otherwise it’s going to drip everywhere. When the biscuits are cool enough, dip one half into the melted chocolate so to have the chocolate only on his bottom. Then take the other half and sandwich the two halves together. The biscuits will keep in an airtight container at room temperature for up to one week.